Following the invasion of the Hyksos, northwestern Semitic people in 1650 BC Egypt entered so-called Second Intermediate Period. Hyksos rulers are referred as the 15th dynasty and ruled Egypt until 1552 BC. However, there were several semi-independed kings under supreme rule of Hyksos (according to Manetho 16th dynasty) including the native Theban noble family (17th dynasty) which declared itself independent around 1560 BC. The Thebans under Ahmose I (the founder of the 18th dynasty) finally expelled the Hyksos and reunited Egypt for the third time in 1552 BC which is marks the beginning the period of New Kingdom. Egyptian pharaohs during the period of the New Kingdom again became viewed as divine beings which resulted in the introduction of marriage between brothers and sisters of royal families. Egypt reached its territorial height during the period of the New Kingdom. Pharaoh Thutmose I (1505-1494 BC) who was the first pharaoh who build a tomb for himself in the Valley of Kings started territorial expansion which made Egypt a leading power in the eastern Mediterranean coast. Territorial expansion of Egypt continued under Thutmose III who was a co-regent with his stepmother Hatshepsut until he was 22. After Hatshepsut’s death Thutmose III expanded the borders of Egypt to Syria and Palestine, while Assyria, Babylon and Hittite Kingdom gave him “gifts” (tribute). 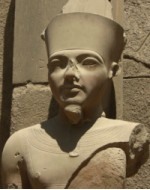 Territorial expansion of Egypt ended with Amenhotep III (1402-1372 BC), while an inner crisis broke out under his successor Akhenaten IV (1372-1354 BC) because of his attempt to establish a monotheistic worhip of Athon, the disk of the sun. He moved the capital city from Tebes to newly established city Amarna but his successor Tutankhamun (1354-1345 BC) famous for his intact tomb discovered in 1922, moved the capital city back to Thebes and reestablished the traditional deities and priesthood. Tutankhamun died at age of 20 not of violent death like it was long believed but because of gangrene which was a result of a broken leg. Horemheb (1333-1306 BC), the last pharaoh of the 18th dynasty ended the inner crisis and Egypt once again emerged as the leading power under the 19th dynasty. 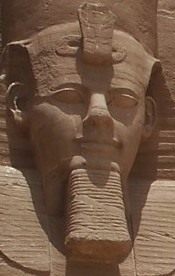 The founder of the 19th century was Ramses I (1306-1304 BC) who was chosen heir by Pharaoh Heremheb himself. Egypt reached its height under his successors Seti I (1304-1292 BC) and Ramses II (1292-1225 BC). Seti I recaptured great part of Syria and strengthened the central authority, while the most famous pharaoh of the 19th century - Ramses II continued his predecessor’s policy and extended the borders of Egypt to southern Syria and to the Fourth Cataract of the Nile. Under his reign Egypt reached cultural, political and economic height which clearly indicate his building activities such as the memorial temple Ramesseum and temples of Abu Simbel. On of the most important events of Ramses’ rule was probably the Battle of Kadesh in 1285 which ended indecisively but resulted in the first preserved peace treaty in history as well as in the first division of territory on spheres of interests. Ramses’ successors managed to retain his territorial gains and political power although Egypt was greatly endangered by Libyans on the west. After death of the last pharaoh of the 19th dynasty Merneptah (1224-1215 BC) Egypt was greatly weakened by the inner struggles. The inner crisis was ended by the founder of the 20th dynasty Setnakht (1186-1184 BC) and his son and successor Ramses III (1184-1153) who is most famous for defending Egypt from foreign invaders: the Sea Peoples and the Libyans. The 20th dynasty became extinct after the death of Ramses XI about 1070 BC, while Egypt was divided into two kingdoms. The period that followed New Kingdom is commonly known as the Third Intermediate Period.